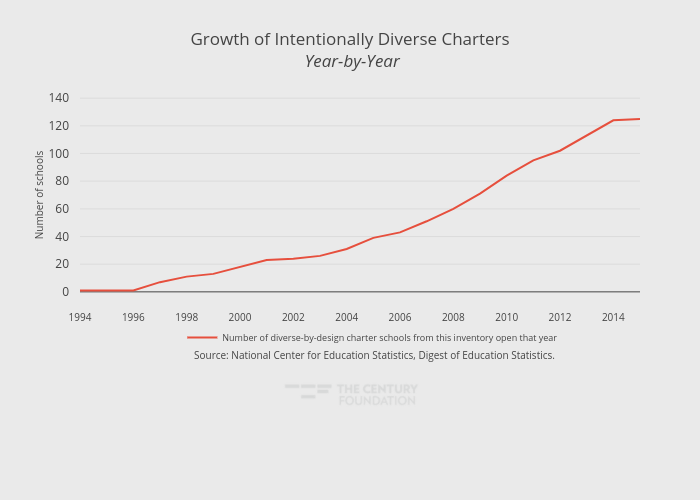 Thecenturyfoundation's interactive graph and data of "Growth of Intentionally Diverse Charters Year-by-Year" is a line chart, showing Number of diverse-by-design charter schools from this inventory open that year; with Number of schools in the y-axis. The x-axis shows values from 1994 to 2015. The y-axis shows values from -5.888888888888889 to 145.88888888888889. This visualization has the following annotation: Source: National Center for Education Statistics, Digest of Education Statistics.